The city of New York never felt so animated and looks superb running on the Pro.So many little touches and Easter eggs.I’m a massive fan of finding collectibles and Spider-Man doesn’t disappoint.The best part of these collectibles is that they are locked into the story mode.The suits are great as are the gadgets. I'm liking it, but I don't think it's significantly different from the numerous spidey games we've had over the years. After the opening sections I'd say the same. So far it feels like a lot of hype for something that could almost pass for a remaster of the PS2 Spider-Man 2 game. I'm enjoying it but so far any possible negatives I've flagged are very familiar to the Spider-Man games, it doesn't give the immediate impression of being Arkham Asylum tier stuff. How is the web slinging and movememt around the city? In the demo I think it was L2 and R2 that you had to alternate. Do you have to do that? The game kind of felt like a reskin of Second Son which I liked. How is the web slinging and movememt around the city? In the demo I think it was L2 and R2 that you had to alternate. Do you have to do that? 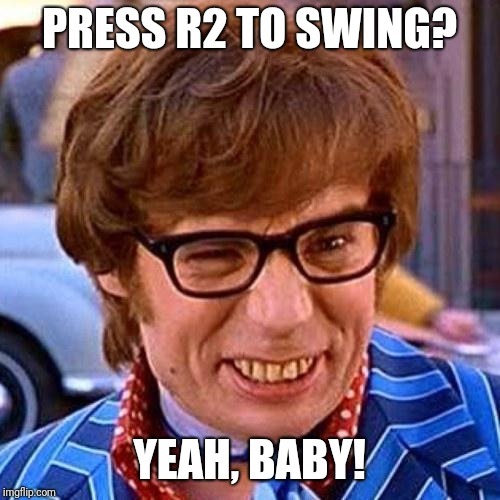 You just use R2 to swing. Again, very similar to the other games, if not a little slower slower than the last one from a few years ago. I'm not sure if it's a bit more technical, in the same way that Bionic Commando was and so it might be that I've just not got the hang of it yet. Or perhaps there are some upgrades that speed it up a bit. Last edited by EvilBoris; 08-09-2018 at 05:39 PM. Before I clicked on the spoiler I KNEW that's what it was going to be. I'm a little over halfway through the game now and it's still fun but man is it last gen in design. There's little to no variation in the missions with all of them focused on the Go to X, beat up enemies, Go to Y approach. The city is pretty much like the old games too, a large expanse to traverse but nothing of note to it, it's just window dressing, mission set ups are repetitive too - lots of construction sites, warehouses, offices etc full of goons. Boss battles are okay, in film they'd look good but one or two push the camera a little. It's mostly good looking, not AAA First Party good looking but still nice enough for the most part. The hype train definitely overtook the game though, whilst it is fun it's absolutely reeking of a 7/10 and would need an immense twist in its gameplay to rise from that. Yeah, in the demo I fought the Shocker which was a disappointing battle to say the least. Reminded me of infamous but less creative if anything.